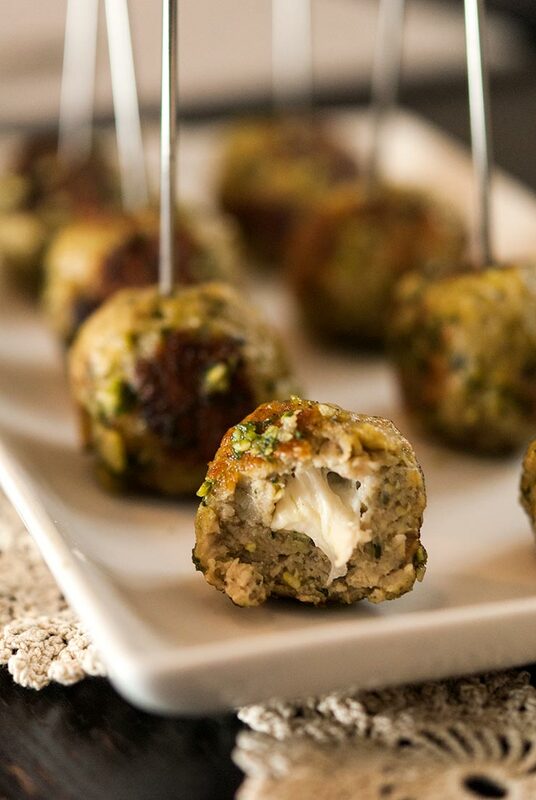 These incredible Italian turkey meatballs with homemade pesto and mozzarella will become everyone’s favorite appetizer at the party! This recipe is so simple and SO delicious! 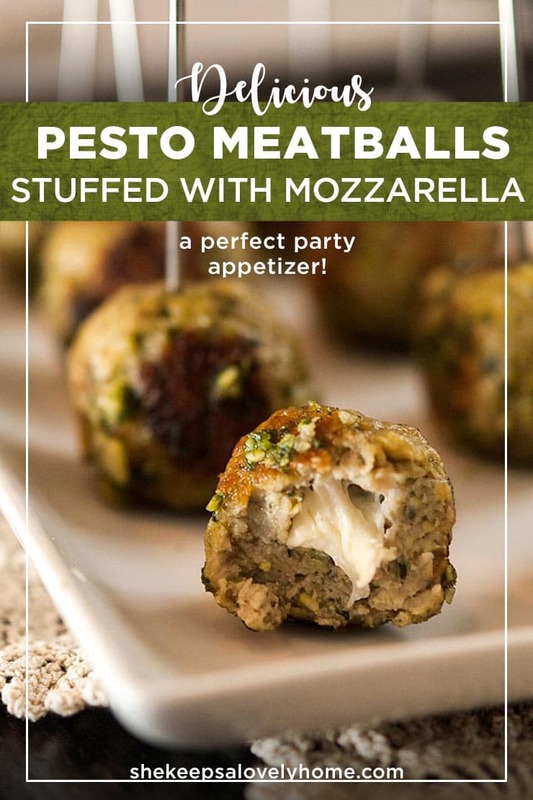 With melted cheese centers and that fresh, Italian pesto flavor, these perfect little appetizers make such an enticing hors d’oeuvre. They’re also gluten-free! 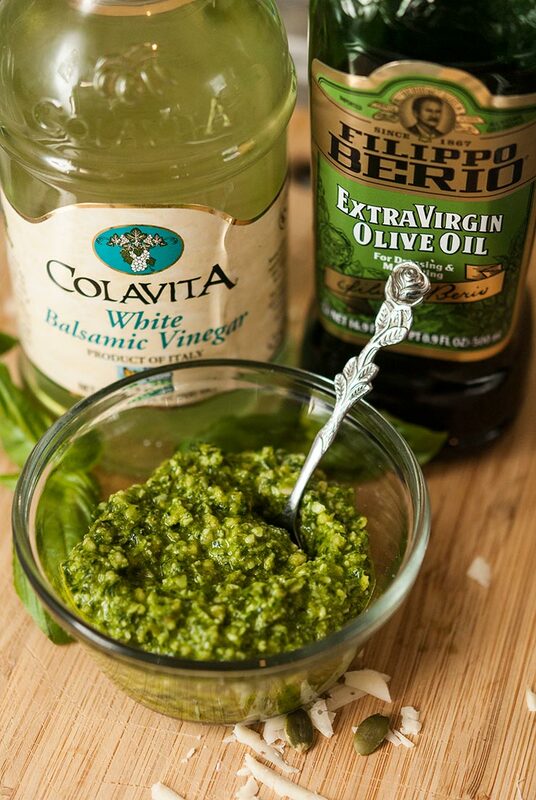 Homemade pesto adds so much magic to your appetizers! If you’ve never made your own pesto before, I promise, you’ll never go back to oily, store-bought pesto again after this recipe! It’s so easy, takes only 5 minutes to make and can be frozen for months if you have some left over! A good friend of mine was having a cocktail party with all Italian appetizers, so I offered to bring these fabulous little meat balls. 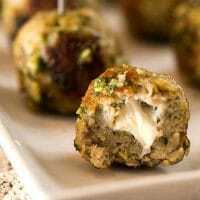 She had baked eggplant-wrapped ricotta with homemade marinara and Italian breaded chicken bites with an array of “antipasti,” so these little pesto meat balls fit right into the Italian ensemble. Although, this recipe is a little untraditional. The dreamy pesto in this recipe is not made with pine nuts, as in traditional recipes. I don’t mean to make your Italian grandmothers clutch their pearls, but I like to use “pepitas” (green pumpkin seeds) in my pesto. They have such a yummy flavor and texture, and they’re MUCH less expensive. I don’t know about your food store, but about a half-cup of pine nuts is $9! Whereas these tasty little pepitas are only $3 and just as tasty. You can certainly use pine nuts, however, if your Italian grandmothers are coming to the party. 1. Don’t substitute homemade pesto with store-bought pesto. Store-bought pesto is usually very oily and you’ll see that this homemade pesto is not oily at all. 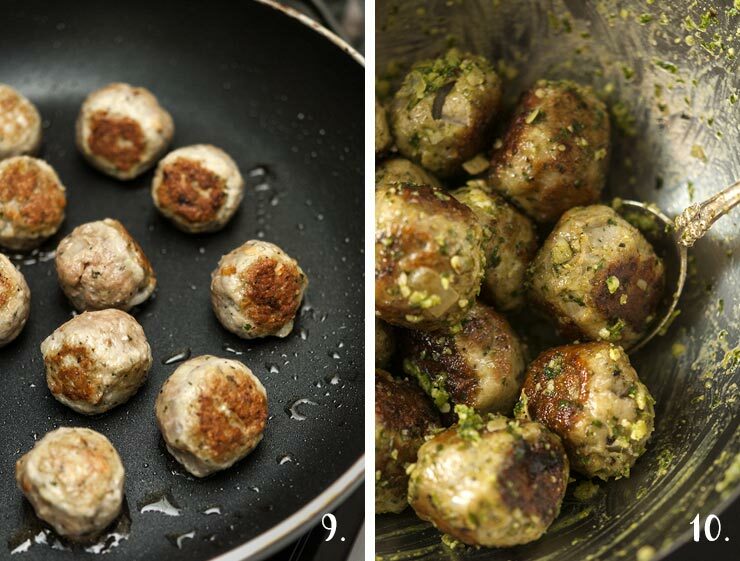 Your meatballs may be too hard to roll if there’s too much oil mixed into the ingredients. 2. Serve them right away. You can always re-heat them, but they really are tastiest right out of the pan. If you want to serve them at a party, I would suggest getting them all mixed and rolled into balls. Then, pop them in the fridge until you’re ready to serve them, then hop into the kitchen for just 10 minutes to cook them while your guests enjoy their cocktails. Whether you re-heat them or make them and serve them right away, make sure not to toss them in the pesto until just before you serve them. 3. Make sure to check that your panko breadcrumbs are gluten-free. Not all panko breadcrumbs are gluten-free, in fact, most aren’t. I used Kikkoman’s brand of gluten-free panko with this recipe. 1. How long do these meatballs take to make? About 35-45 minutes. 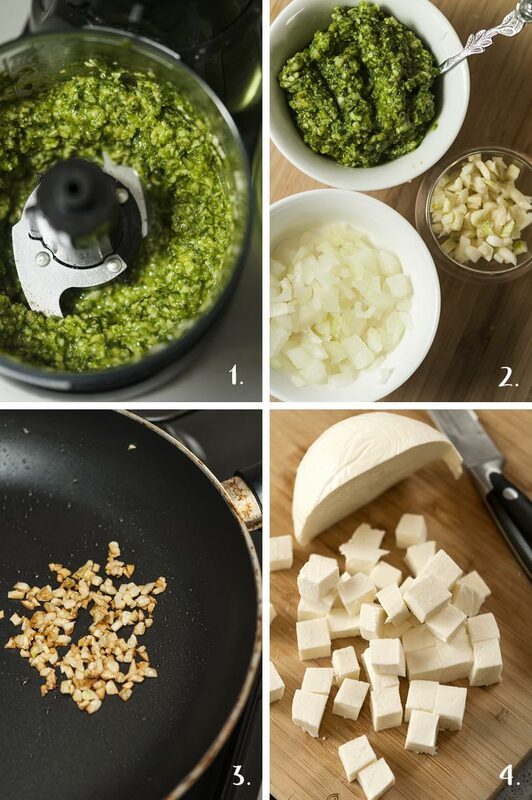 5 minutes to make the pesto. 10 minutes to prep and mix your ingredients. 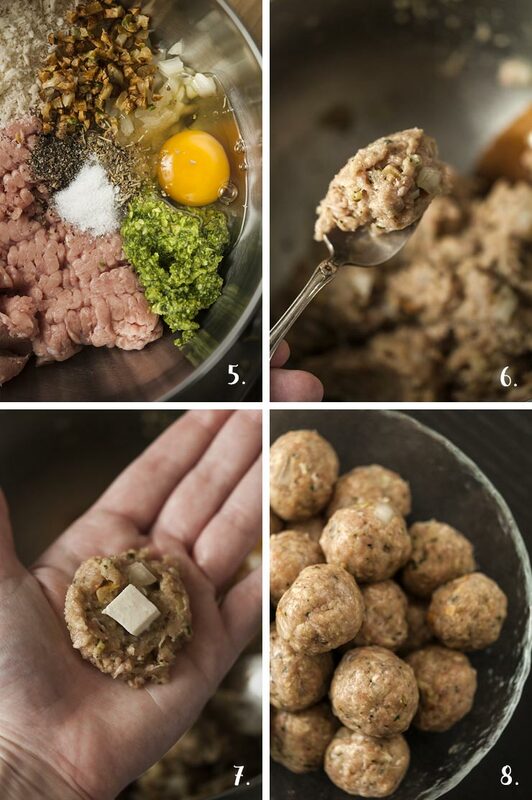 10 minutes to roll your turkey balls and 10 minutes to cook them in the pan. 20 if you do it in 2 batches. 2. Can I make any substitutions? If you’re not concerned about your turkey balls being gluten-free, use regular panko or unflavored breadcrumbs. If you don’t have breadcrumbs, you can use crushed saltines or even food-processed cauliflower, chopped up into “crumbs” to make them low carb! If you don’t have fresh mozzarella, you can use almost any tasty cheese that melts well. I suggest regular mozzarella, havarti or fontina. If you don’t have pepitas, you can always use pine nuts, almonds, cashews, pistachios and even macadamias. 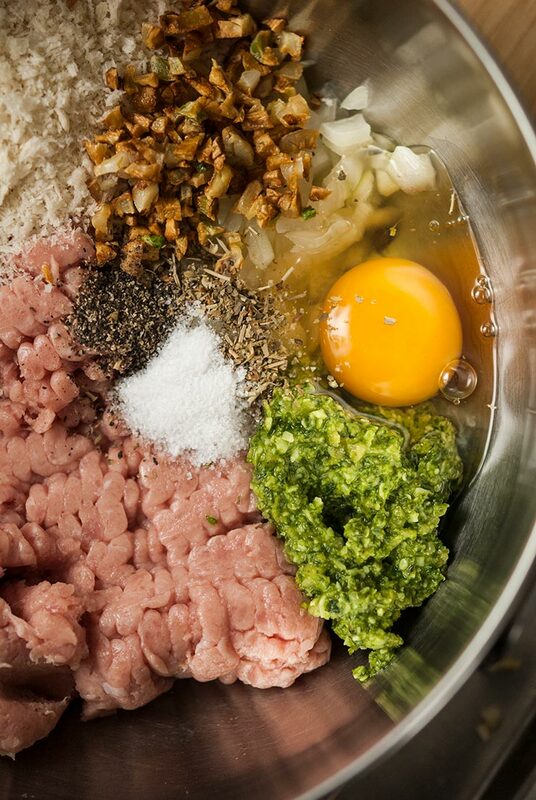 If you don’t have turkey, you can certainly use ground chicken, pork, beef, or lamb with this recipe. They’ll all be equally delicious. 3. How do I store and re-heat them? It’s highly recommended that they be served right away, but you can always store them in a container with a lid for a week and a half in the fridge. You can also freeze them for months. To re-heat them, pop them in a pre-heated oven at 375 for 15 minutes. NOTE: don’t toss them in pesto until you’re ready to serve. If you reheat them after they’ve been tossed in fresh pesto, they’re not quite as tasty. 1. In a food processor, add 1 cup of fresh basil leaves without stems, 3 tbsp. fresh-grated parmesan cheese, 3 tbsp. olive oil, 2 tsp. white balsamic vinegar and 2 tbsp. of pepitas. Process until well-chopped and almost creamy. This should yield about 4 tbsp. of pesto. 2. Dice ½ of a small white onion. Set aside. Mince 3 large garlic cloves. 3. Add 1 tsp. of olive oil to a frying pan. Turn the heat to medium and brown your garlic in the oil for 2-3 minutes. Remove and set aside. 4. Chop your Mozzarella into tiny half-inch cubes. You’ll need about 25 cubes. 5. To a mixing bowl, add 1 pound ground turkey, 1 cup gluten-free panko bread crumbs, toasted minced garlic, 1 large egg, diced onion, 2 tbsp. of pesto (save the other 2 tbsp. 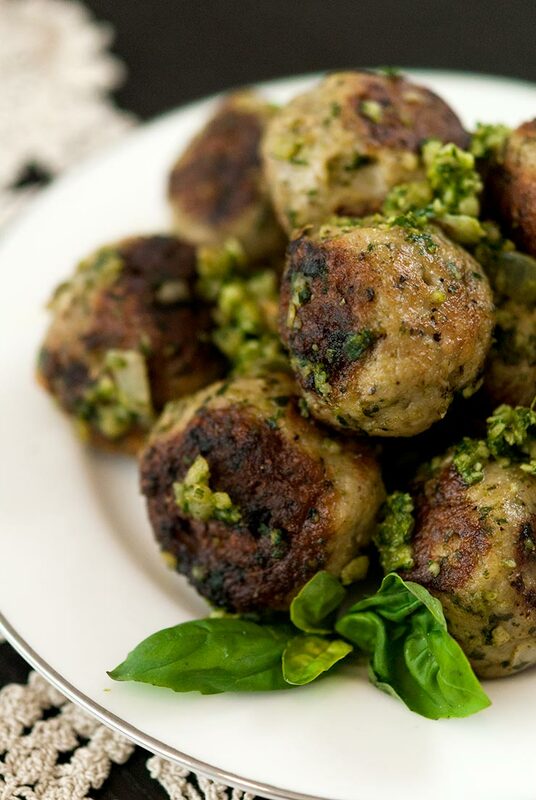 to toss the meatballs in when they’re ready to serve), ½ tsp. Italian seasoning, ½ tsp. garlic powder, ½ tsp. pepper and ½ tsp. salt. Mix ingredients thoroughly. 6. Spoon a rounded tsp. of meat for your meatball. 7. Place it in your hand and add a cheese cube to the center, then fold the meat around the cheese, making sure it’s completely covered. You don’t want it melting through a little hole into your pan. 8. Roll each ball and carefully place them in a bowl or on a plate. 9. Add a tbsp. of olive oil and coat the frying pan. Distribute the balls with about an inch of space between them. Turn the heat to medium and allow each ball to heat on 1 side for about 2-3 minutes, then gently flip them to the other side to brown. Every 2-3 minutes, flip them to a pink side. They should only need about 10-12 minutes to cook. 10. Remove the turkey balls from heat (after cutting into 1 to make sure they’re cooked thoroughly through and the cheese is melted). Place turkey balls in washed mixing bowl, toss with the remaining 2 tbsp. of pesto and serve. 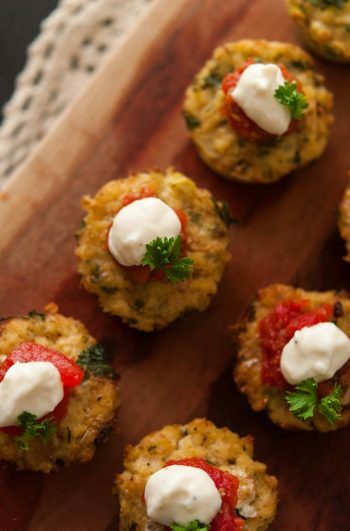 With melted cheese centers and that fresh, Italian pesto flavor, these perfect little appetizers make such an enticing hors d'oeuvre. They’re also gluten-free! 1 cup fresh basil - just leaves with stems discarded. In a food processor, add 1 cup of fresh basil leaves without stems, 3 tbsp. fresh-grated parmesan cheese, 3 tbsp. olive oil, 2 tsp. white balsamic vinegar and 2 tbsp. of pepitas. Process until well-chopped and almost creamy. This should yield about 4 tbsp. of pesto. Dice ½ of a small white onion. Set aside. Mince 3 large garlic cloves. Add 1 tsp. of olive oil to a frying pan. Turn the heat to medium and brown your garlic in the oil for 2-3 minutes. Remove and set aside. Chop your Mozzarella into tiny half-inch cubes. You’ll need about 25 cubes. Set aside. To a mixing bowl, add 1 pound ground turkey, 1 cup gluten-free panko bread crumbs, toasted minced garlic, 1 large egg, diced onion, 2 tbsp. of pesto (save the other 2 tbsp. 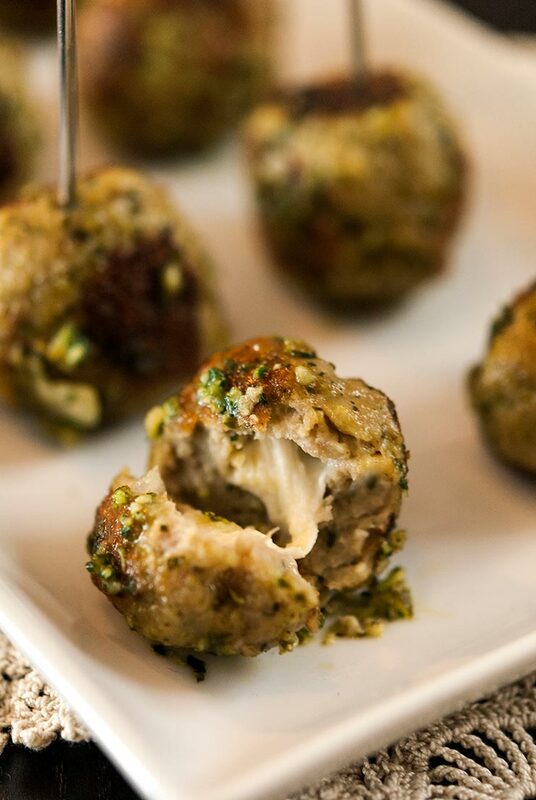 to toss the meatballs in when they’re ready to serve), ½ tsp. Italian seasoning, ½ tsp. garlic powder, ½ tsp. pepper and ½ tsp. salt. Mix ingredients thoroughly. Spoon a rounded tsp. of meat for your meatball. Place it in your hand and add a cheese cube to the center, then fold the meat around the cheese, making sure it’s completely covered. Roll each ball and carefully place them in a bowl or on a plate. Add a tbsp. of olive oil and coat the frying pan. Distribute the balls with about an inch of space between them. Turn the heat to medium and allow each ball to heat on 1 side for about 2-3 minutes, then gently flip them to the other side to brown. Every 2-3 minutes, flip them to a pink side. They should only need about 10-12 minutes to cook. Remove the turkey balls from heat (after cutting into the largest one to make sure they’re cooked thoroughly and the cheese is melted). Place turkey balls in washed mixing bowl, toss with the remaining 2 tbsp. of pesto and serve.